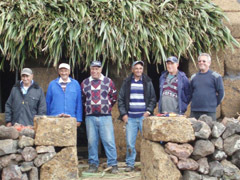 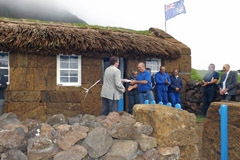 Opening of the Thatched House Museum, which is a newly built traditional Tristan cottage thatched with New Zealand flax. 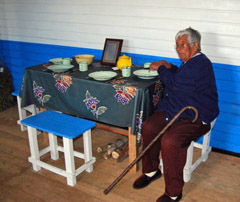 Martha Glass on a stool by the open hearth - similar to a scene she would have experienced as a child in her family home. 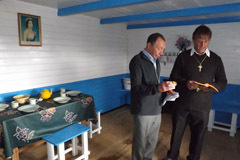 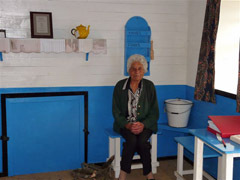 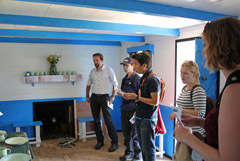 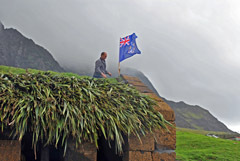 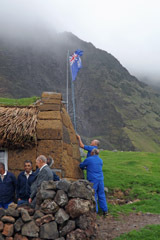 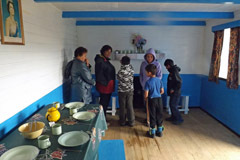 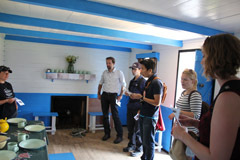 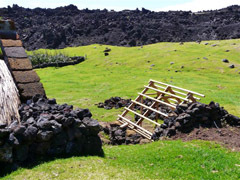 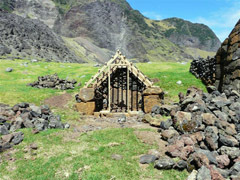 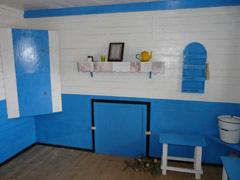 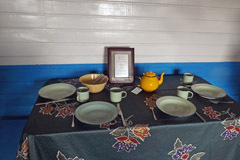 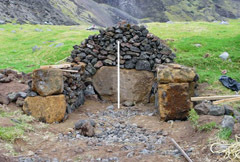 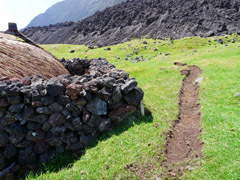 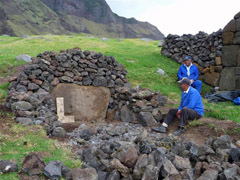 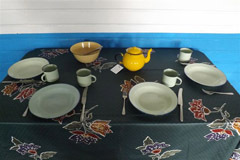 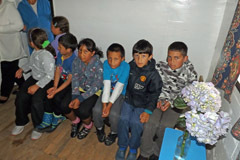 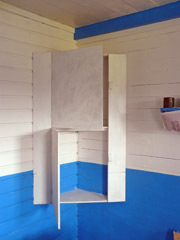 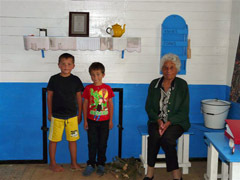 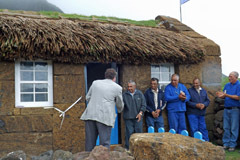 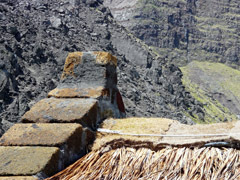 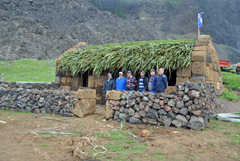 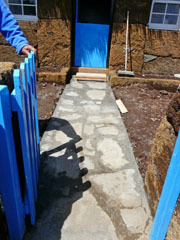 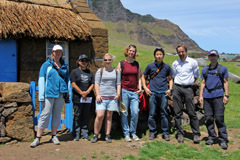 Care has been taken to source furnishings typical of basic Tristan da Cunha cottages. 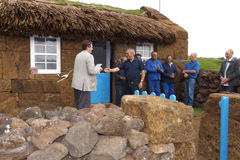 Thank you all for coming here today to help us mark this very special occasion of the opening of the traditional thatched house. 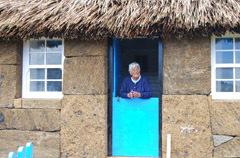 When I first took over the post of Tourism Coordinator in 2009 I was inspired by a close family member to build a traditional house. 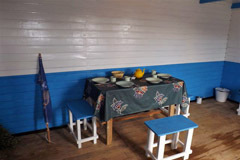 Since all Tristan homes had now been housed with zinc the idea grew and I thought it would be great to build a Live Museum for visitors and also a relic for our younger generation so they will always remember how our ancestors lived so many years ago. 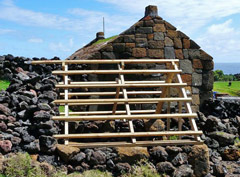 I remember very clearly going home and telling my dad this plan to build a traditional house and his response was”get the damn out of this you’ll never get a thatched house built”. 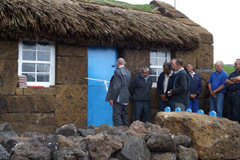 My dad was in fact correct to a point, as without the commitment and dedication of Herbert, Ches, Donald, Anthony, Eric, Joseph and Piers this house would never have been possible. 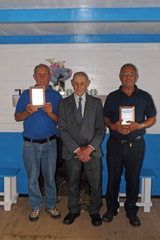 It has been a great privilege to work alongside the older generation of Tristan and see their attitudes to Tristan life and hard work. 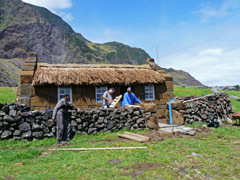 My only wish will be that this house will one day help our younger generation to see Tristan through their eyes. 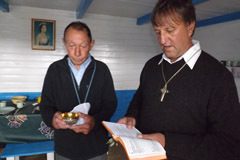 Today the house will be blessed by Lars and James to represent our community’s two religions. 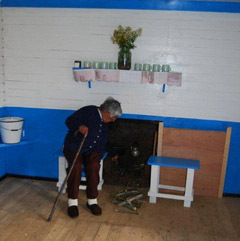 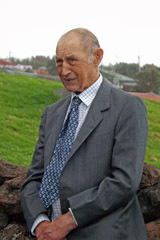 Uncle Andrew will officially open the house as he is the oldest living member of the Glass descendants and we thought it appropriate that it should be opened in memory of William Glass the founder of our community. 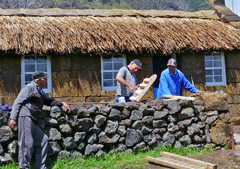 To get to this point has been a real community effort and I would like to take this opportunity to thank all those people who have worked on the house, assisted with ideas and loaned or made items to place inside the house, you know who you are. 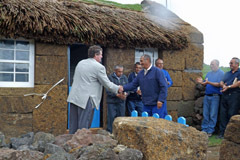 I would also like to thank Sean our Administrator for the support he has given us throughout this project and last but certainly not least I hope you will join me in saying a big big thank you to the pensioners for making the communities dream a reality. 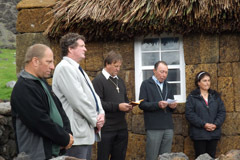 Front Row: Piers Hagan, Andrew Glass, Ches Lavarello and Donald Hagan. 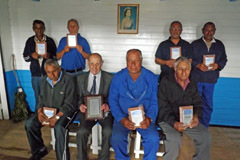 All are showing their commemorative plaques. 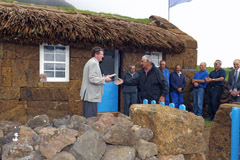 It has been a privilege to put together the thatched house pages from my home in Somerset which chronicle the remarkable project to build a new Tristan Traditional Thatched House Museum directly beneath the 1961 lava flow, dedicated to community founder William Glass and the only house east of the Big Watron. 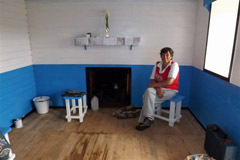 Dawn Repetto's vision and commitment to this project has been exceptional. 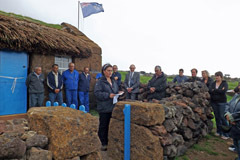 The community should be proud of what Dawn, her pensioner builders, and the larger team have accomplished. 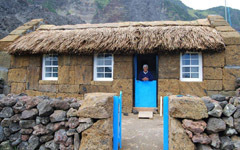 No doubt the museum will also be a mecca for tourists lucky enough to visit the world's most isolated village.